- you are managing a large number of retail outlets in a Petrol Station Chain throughout the county with 600 plus Secuity Appliances. The Mako Networks Central Management System is the Magic that allows the reduction in cost, the ease of creating and changing mesh networks, the ability to send a Mako Networks Security Applicance to a remote site and have its three cables connected ( Power, Internet/ADSL and LAN ) and start working almost immediately. - Request for enhancements etc. Please note our discussion is only highlighting some of the functions and features, should you have queries or questions regarding Mako Networks Security Appliances and the Central Management System CMS, then please contact IT Consulting & Services by email or phone and we can provide further information and specific responses. 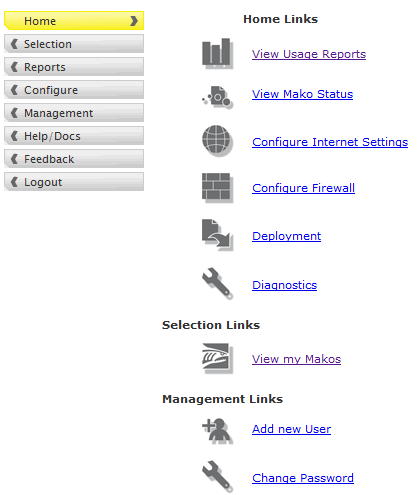 The Home Button provides access to the all the funtions available on the Mako Network Appliance. It provides some links on the home page to areas that are normally required on a more frequent basis, like the Mako Status area and the Configure Firewall. The Selection Button takes you to a list all the Mako Network Security appliances that are managed under your account on the Central Management System. The list allows you to Select the Mako Networks Security Appliance that you need to work with to make changes, modifications and analyse the traffic through the Security Appliance. The Report system is extensive and placed next on the Menu system as it is more frequently used. All the traffic data is available and presented in an easy to analyse layout, the Reporting allows for time based data to be selected and presented in bar graphs, pie charts and tabular data formats. The available reports include Mako Usage, Status, Licences, Diagnostics, Syslogs, PC Usage, Remote Access, Mako Guardian Usage and SharkNet IDS. 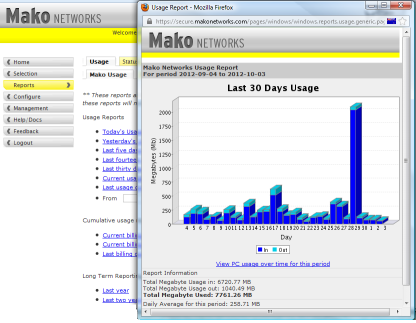 Usage Report Screen - Showing the Mako Usage, Bar chart below for inbound traffic volume and outbound traffic volume. 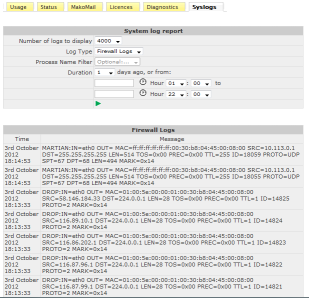 Within the screen there are links to traffic by PC connected to the Mako Networks Security Applicance using the same data. 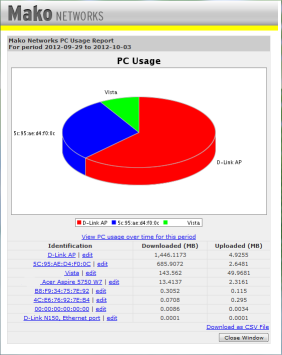 The network shown has a separate Wireless Access Point and a NAS box, these are listed on the pie chart. The tabular data identifies other PC's that are not on the network when this image was created. This pie chart is showing a significant number of intrusions from Singapore locations. There are also intrusions from countries like China and USA, but these are small in number and lower down in the table not shown in this image. The Syslog report can be published by including the Firewall data or you can call up a separate firewall report as shown above. 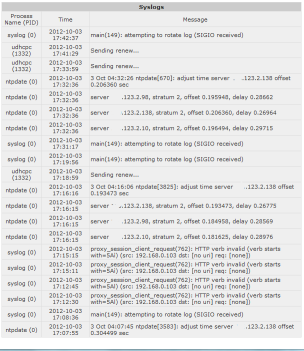 The Syslog reports are generated by selecting the date range that you require and then selection the number of records to be displayed. The above reports are only a sample of the types of reporting that are available from the Mako networks CMS. There are several other tab's like the Mako Guardian Usage, Licenses, Status and Remote Access that should you be interested then contact us and we will provide a presentation and demonstration of the Mako systems in operation here in Singapore. The Configure area is normally where you will start after a Mako Security Applicance has been installed on site. Within 15 minutes of being connected to the internet the box will be available via the Mako Networks Central Management System - CMS. 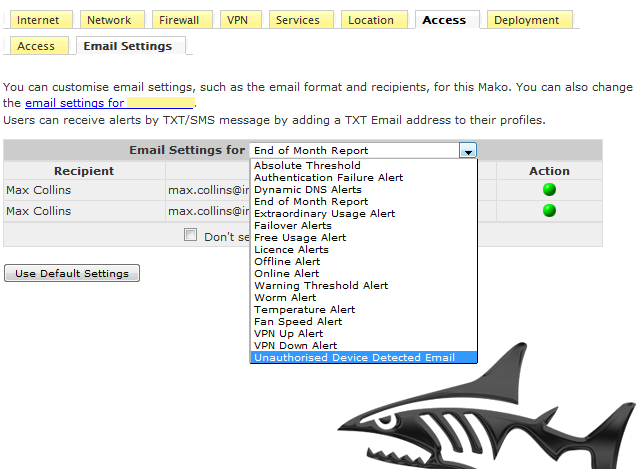 To have the Mako Networks Security Appliance connected you need to know all the settings from the ISP. 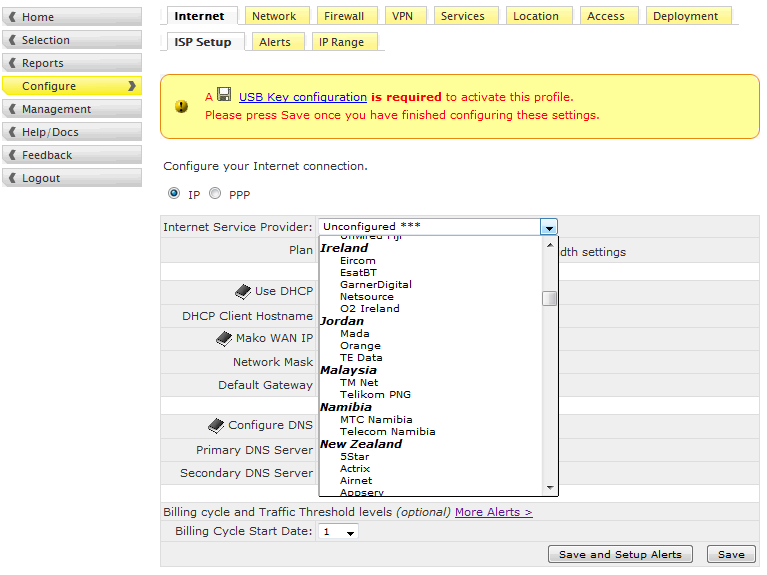 Mako Networks has contacted the ISP's and added the connection information to the CMS database and so you select by country, ISP and then the plan. 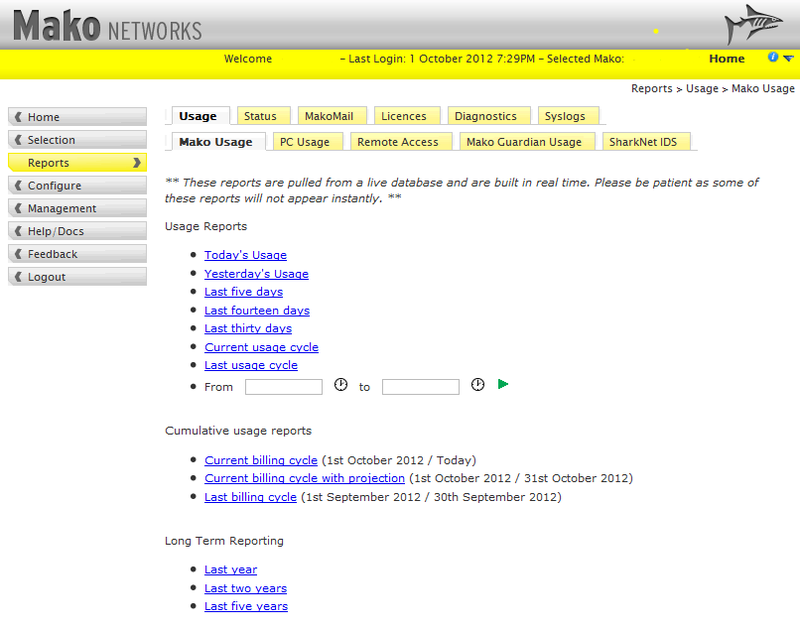 The screen shot shows a drop down box with some of the telco operators that Mako Networks has installed in its database. Some of the plans for Malaysia are shown. 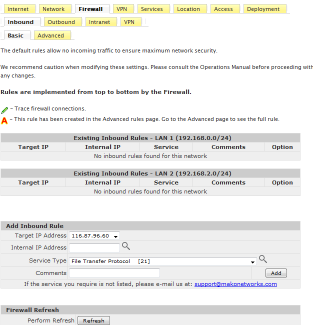 The screen shot shows the tabs under the Configure Button to connect to the ISP, set up the Firewall, set Alert messages by email or SMS. 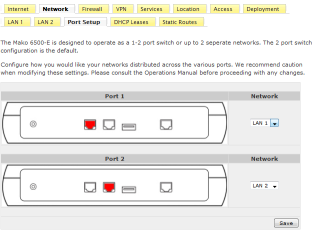 Important in this area are the setup of the Security Appliance ports and the DHCP Servers by LAN port. The Mako 6500 has been designed to operate with a different IP range and DHCP Server on each port - this provides the necessary separation when Payment Card Industry Data Security Services - PCI DSS is implemented. One of the foremost features of the Mako Secuity Applicance is the three Click VPN's - building a Mesh Network is simple, select the first Mako Security Appliance from a drop down box, select the second Mako Security Appliance from a drop down box and then clicking to join them in a VPN. The Mako Security Appliances Firewall has been certified by ICAS Labs and by visiting the site you can verify by undertaking a search to find Mako Networks listing. Choose Mako Networks from the Certified Product Vendors list. The Access Alert configure screen above Drop Down shows a list of Alerts that can be configured to be sent by email or SMS in the event of specified conditions. This location allows for Administration tasks relating to IT Systems Integrators that manage their clients Security Appliances, Users and Users Access rights. A text box is provided for suggestions, product features, CMS web site usability, support issues, information and data that you provide to Mako Networks. Mako Networks and IT Consulting and Services entered into an agreement in September 2012 where IT Consulting and Services will sell and support Mako Network products in Singapore. The Mako Networks range of Security Appliances also includes Network End Point gateways 6550 and Data Centre grade Internet gateways and larger VPN Concentrators. Please refer to other pages on our site for the 6500, 7550 and 8875 models. Mako offers four Network Appliances, two of these the 6500-E and the 6500-A2 are targeted at small sites and businesses, the Mako 7550 is for larger sites with additional capibilities as a Virtual Private Network Concentrator and as a High Throughput Gateway. 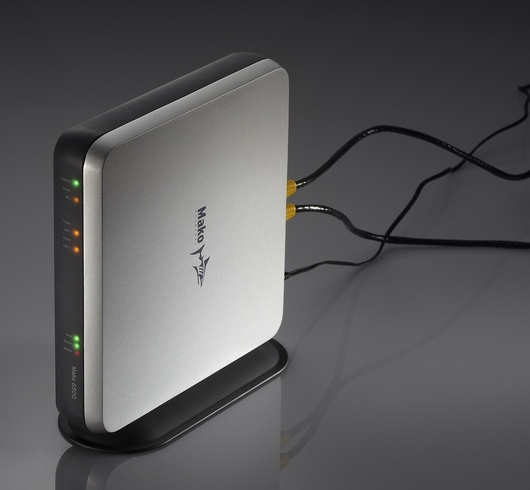 The Mako 8875 for the data centre and is designed for high availability, a Virtual Private Network Concentrator and as a High Throughput Gateway. Some of these applicances have more fucntionality by adding additional licenses and all can be part of a Payment Card Industry Data Security Standard PCI-DSS certified systems to level 1. Firstly, some good news! According to Symantec, Singapore's number of viruses per computer is less than half the global rate. While that is an impressive stat, it doesn't mean Singapore is free from cyber-crime. Far from it in fact. 72% of adults online in Singapore have been a victim of cybercrime in their lifetime, 48% were in the past year. On average, the direct financial cost per victim is $657.According to Norton's 2012 Cybercrime Report, that equates to more than 1.4 million people suffering approximately US$944 million in direct financial losses. If that sounds like a lot, it's because it is. The global average is $197. Norton puts this down to greater affluence among Singaporeans and higher levels of credit card fraud. Overall though, Singapore's cost of cybercrime is lower than other Asian countries; China lost $46 billion, while India's saw $8 billion losses. "Cybercriminals are changing their tactics to target fast growing mobile platforms and social networks where consumers are less aware of security risks," said Effendy Ibrahim, internet safety advocate and Director for Norton Asia. According to a survey commissioned by Pointsec, 85,000 mobile phones and 21,000 PDAs and smartphones were left on taxis in Chicago over a 6-month period. The survey also found that more than 63,000 mobile phones and 5,800 PDAs and smartphones were left in London taxis during the same 6-month period. Companies surveyed reported that technical product, sales and/or customer details are being kept on employees' mobile devices, many of which are personal devices rather than company-issued devices. 3. Opening an application from an unsecured/unknown source - like games! In McAfee's 2008 Mobile Security Report, 64 percent of mobile Web users surveyed expressed worry about surfing on the mobile web/downloading content. One in seven global mobile users report that they have already been exposed to mobile viruses, either directly or through knowing someone whose phone has been infected. Some of the most prevalent mobile viruses and worms use an unprotected Bluetooth connection to get into mobile devices or to spread to other devices. This includes two of the most common mobile device viruses, both with a number of variants, Cabir and CommWarrior. According to Dan Swinhoe of IDG 22% of SMB's spend more on coffee than they do on IT, That's a lot of companies. However, the study said that one in six SMBs had suffered a security breach in 2011. Elsewhere, the cloud is a set to be a big source of spending in the coming months and years. 48% of SMBs currently use the cloud, and that figure is expected to rise to 62% by the end of the year, global spending totaling $40 billion. Spending and adoption figures are expected to rise steeply in the coming years, reaching $100 billion by 2016. So Dan conclude SME budgets seem to be increasing steadily year-on-year, and even if companies drank the world's most expensive coffee, at $80 a cup $1.6 billion a year equals 20,613,698 cups, so no one is going to go thirsty. Regionally, Europe along with Russia and Turkey are expected to constitute the largest market - accounting for one third of tablet demand - followed by North America and Asia. The Middle East and Latin America will likely show the largest growth, representing around 50 million unites by 2016. 1. affordability - low-end devices and natural price decline will provide access to less affluent customer segments, providing 60% of the growth. McKinsey reported that the Japanese consumer is changing dramatically - They are moving to the internet to buy more private labels and by 2015 are expected to be spending US$ 50 Billion annually from a base of US$ 30 Billion today. The current overall retail growth for Japan's retail market is -1.3%. Domino's Pizza planned on taking 5% of orders online however they are currently achieving 35% - beyond expectations. In a recent article distributed on the internet, Riverbed Technology Ltd advised that the following five factors should be used in providing IT Infrastructure: 1. Distance doesn't matter. 2. Applications and data must bed everywhere - and in one place. 3.Knowledge must be harnessed - and data must be managed. 4. Business never stops and 5. There are no second- class enterprise citizens.